One of my all time favorite Disney movies is Beauty and the Beast. It is returning to theaters in 3D this January 13th! Logan and I had a chance to sneak a peek at the movie today. It brought back so many fond memories. At times I was tempted to sing along! The 3D version of the movie brought a classic movie into modern day. I loved it. Who can't love a girl who is wooed by a library full of books? Here's my book loving princess, Belle. If you follow the link below, you'll find other free character printables courtesy of Disney! 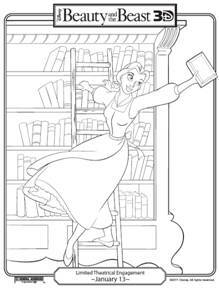 Beauty and the Beast 3D Coloring Sheets--Free! You have a terrific site here! I am so glad I found it and I am your newest follower!